The new 620 pupil Central Middle School is located on a 4 acre urban site near downtown Quincy and the related historic district. The site design and building design respond directly to the urban site constraints; while simultaneously capitalizing on the opportunities that lie within this two-sided parcel at the corner of Hancock Street and St. Anns Road. The final solution is a functional, vibrant and aesthetically rich streetscape which transforms this city street corner. The middle school design provides a superior learning environment through thoughtful implementation of natural day-lighting strategies, enhanced classroom acoustic techniques and indoor air quality measures. Additionally, proposed design features such as the "Wall of Presidents", learning modality exhibit, literature word display, and real-time data collected from the building's sustainable design systems optimize the facility as a teaching tool that is integrated to the educational curriculum. 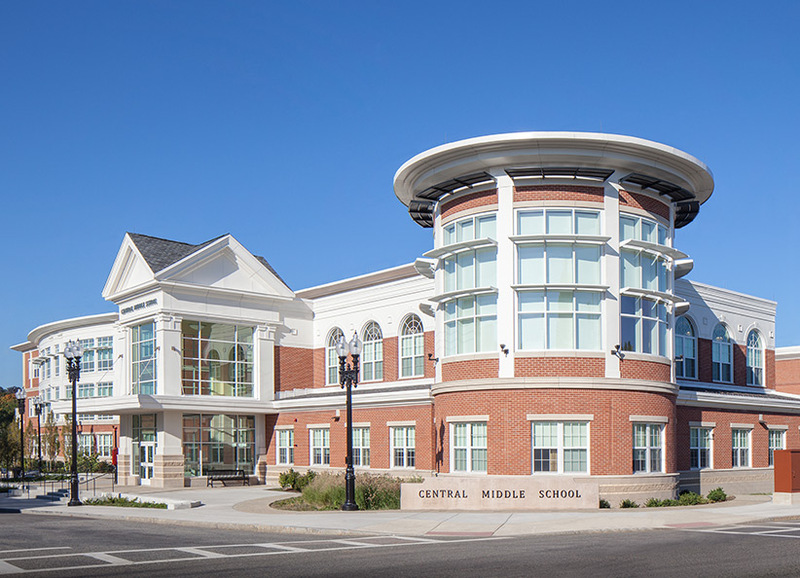 The New Quincy Central Middle School building will be an advanced placement feeder school and will set a new standard for 21st century educational and sustainable environments within the City of Quincy.